Pooh’s Heffalump Halloween Movie DVD: Gift Set with Plush Pooh – Such a cute gift idea for a Halloween birthday. Look for it in-store because it may be kind of tough to get online (Amazon seems to only have Amazon Marketplace buying options), but if you can find it – this bundle of Pooh’s Heffalump Halloween movie Gift Set with a plush Pooh Bear (dressed as Tigger) is adorable. Hit Entertainment: Trick or Treat Tales – my kids love these assorted show DVDs that come out seasonally from Hit Entertainment. This one includes Bob the Builder, Barney, Fireman Sam and Fifi in various Halloween-related episodes. Shaun the Sheep: Little Sheep of Horrors – more Halloween with Shaun the Sheep’s Little Sheep of Horrors. 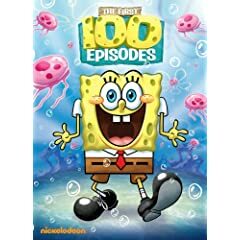 Spongebob Squarepants: The First 100 Episodes – An awesome Holiday present this year fort the Spongebob fan would be Spongebob Squarepant’s First 100 Episodes box set. It releases on September 22nd of this year but you can pre-order it on Amazon for $64.99. (it’s retailing for $100 so although that price sounds steep it’s actually quite a discount!) I don’t know how anyone could get through 40+ hours of all Spongebob, but hey, anything’s possible with sick days and snow days, right? For all you Bluray fans, Disney Princess – Enchanted Tales: Follow your Dreams is being re-released with a special Bluray edition. iCarly: Season 2, Volume 1 – I’m sure tweens and teen fans alike will be happy to collect the first release of iCarly’s second season, which released August 18th. LeapFrog: Let’s Go to School – loving all of these new educational yet entertaining DVDs from LeapFrog including this Let’s Go to School release. It’s a steal at only $8.99 on Amazon and it’s a good video for any kids who entered a new school this fall or are dealing with a school transition. Bob the Builder: Call in the Crew – there are 5 episodes in this latest release from Bob the Builder.